Step up for those that cannot, step up to make a difference, step up to make a change. Each year, the Graduating Class of Notre Dame High School leads a Service Project. A charity is chosen and Teams of 6 create events designed to raise money for that charity, Creating healthy fun competition for an amazing cause. This year, the chosen charity is Parkland School. Parkland School operates a program designed to meet the educational needs of mentally and physically handicapped children and young adults. Their purpose is to provide individualized programming which will enable each student to maximize his/her potential. They provide a full range of academic, pre-vocational, recreational and social skills areas which are needed for successful and productive participation in community life. Help me raise over $5,000 for this charity. 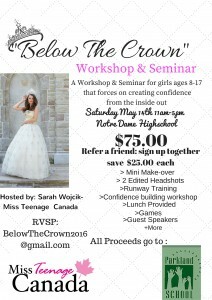 Introducing “Below The Crown”, A workshop and seminar for young girls ages 8-17 that focuses on building confidence from the inside out. The workshop will be held on May 7th, 2016 from 11am to 5pm at Notre Dame Highschool in Red Deer, Alberta. The day will consist of confidence building activities, games, guest speakers and much more! 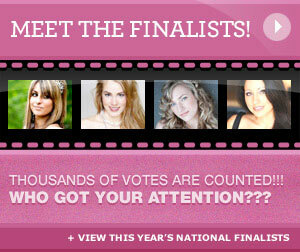 Each girl will receive a mini makeover and 2 edited headshots, as well as lunch is provided. Tickets are $75.00 or if you refer a friend and sign up together you both will receive $25.00 off. There are only limited spots available, if your interested please send an email to BelowTheCrown2016@gmail.com to sign up! Don’t miss out and help make this event a huge become a yearly occurrence.